Thanksgiving is less than a week away and I am getting ready early for my holiday baking and cooking my fresh blue Hubbard squash and pie pumpkins. I have been using fresh blue Hubbard squash or pie pumpkins to make my Thanksgiving pie for over 20 years. Marrying into a farm family helped me understand all the uses for fresh winter squash. 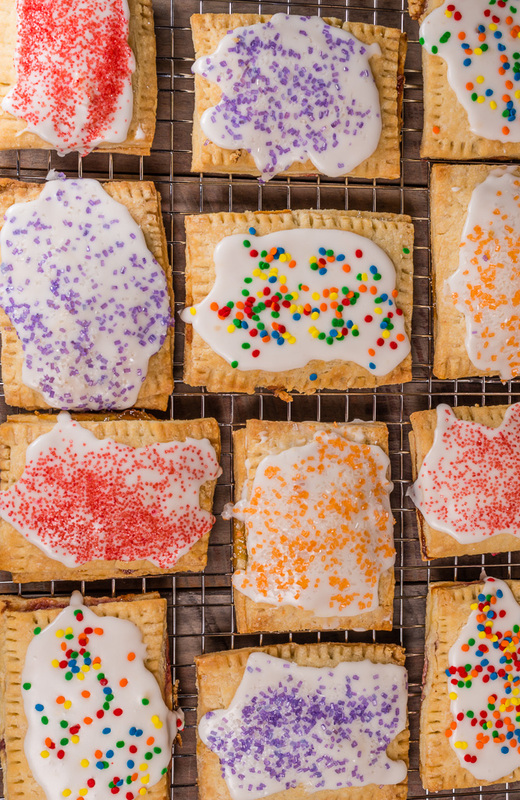 The fresh taste you get from baking your own you will make you never open a can again. 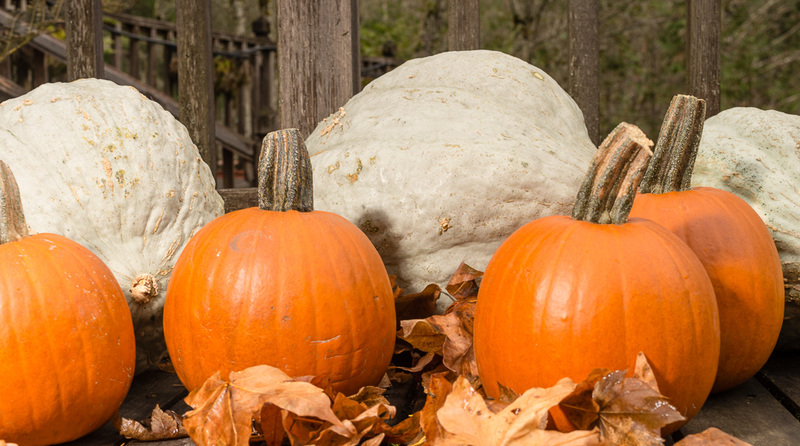 Both the blue Hubbard squash and pie pumpkin can be found at your local farm stand or farmers market. I bought my blue Hubbard squash a month ago during the fall harvest season at Kiyokawa Family Orchard and Farm Stand in Hood River, Oregon. 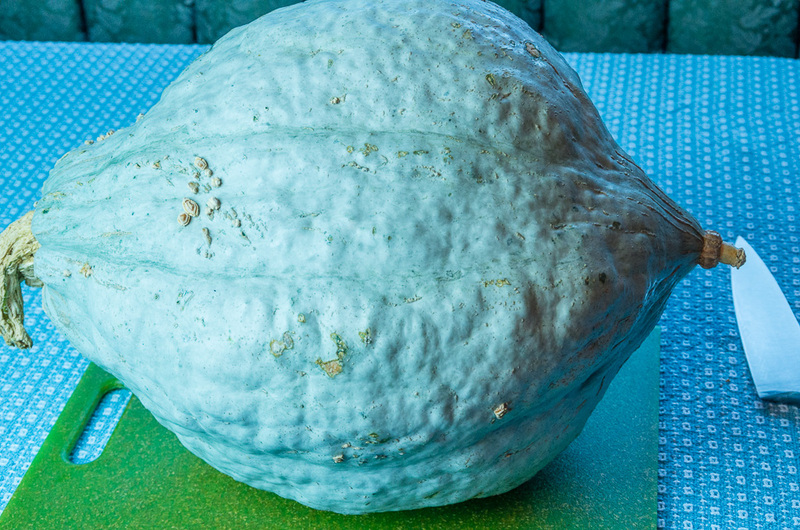 The blue Hubbard squash may look like it came from another planet but this light blue and odd shaped squash has been used for a long time. I can picture the covered wagons heading west to Oregon with blue Hubbard squash in back. With its hard and thick shell they can keep for many months. I got a few extra Hubbard squash and stored them in my cool garage to use later during the winter months. 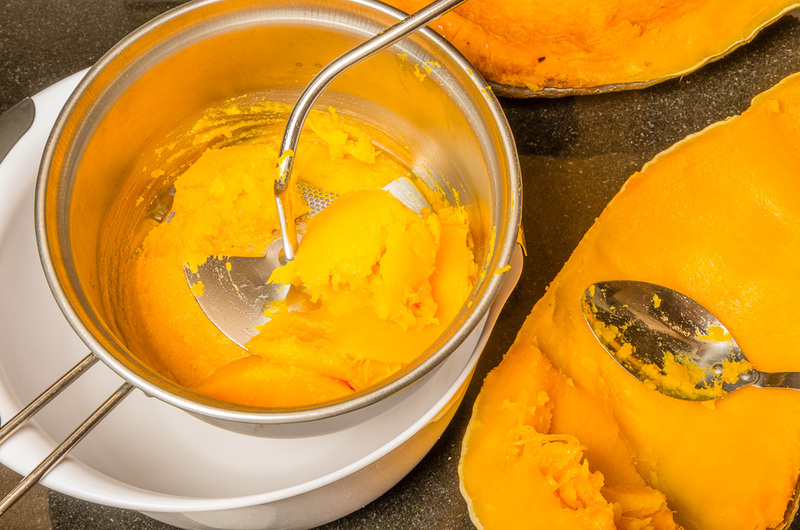 To prepare the Hubbard squash or pie pumpkin cut in half and scoop out the seeds and as much fiber as you can. Do not throw away the seeds you can roast them later. Place upside down on a rimmed baking sheet and place into a 350 degree oven. 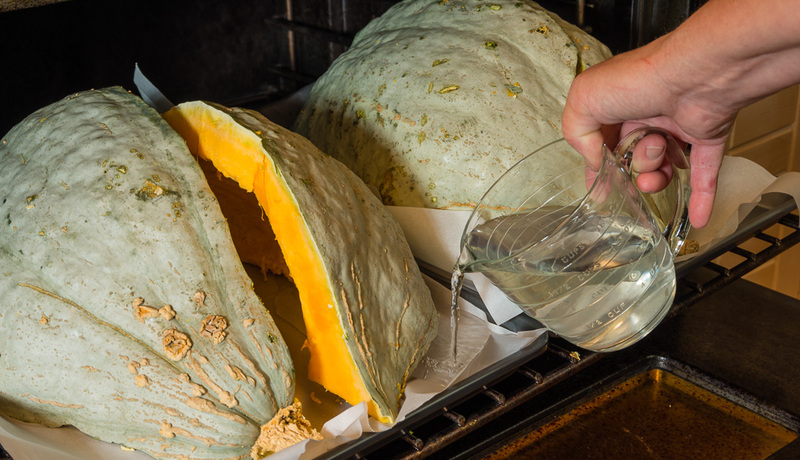 Pour 1 cup of water in the pan, this we help steam the squash or pumpkin. Bake for at least 1 hour or until it is soft. I stick a knife into the shell and if it comes out with ease it is ready. Take out of the oven and flip them over, let cool for 30 minutes. With a food mill placed over a bowl scoop spoonfuls of the squash or pumpkin in and turn the handle to push the squash or pumpkin through. You will get a nice smooth puree in your bowl. Using a food mill helps to collect any fiber or seeds you may have missed when preparing the squash or pumpkin. 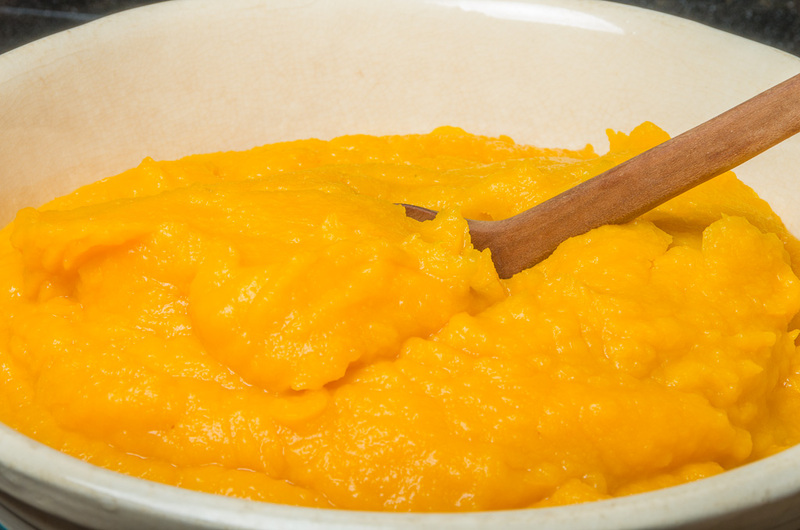 The general rule for the amount you will need for a pie is 1 cup of the pumpkin puree to make one pie. 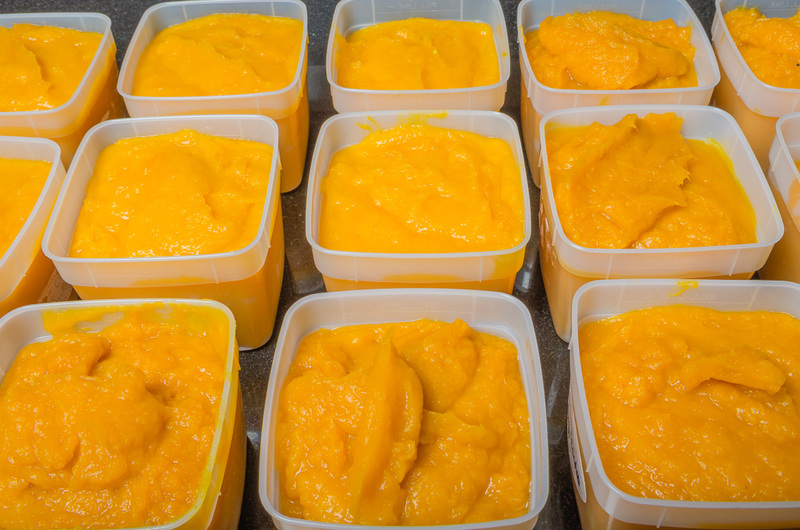 I like to have the puree ready any time I need it so I cook a lot at one time and place 2 cups in a freezer container. You can keep in the freezer for up to a year. 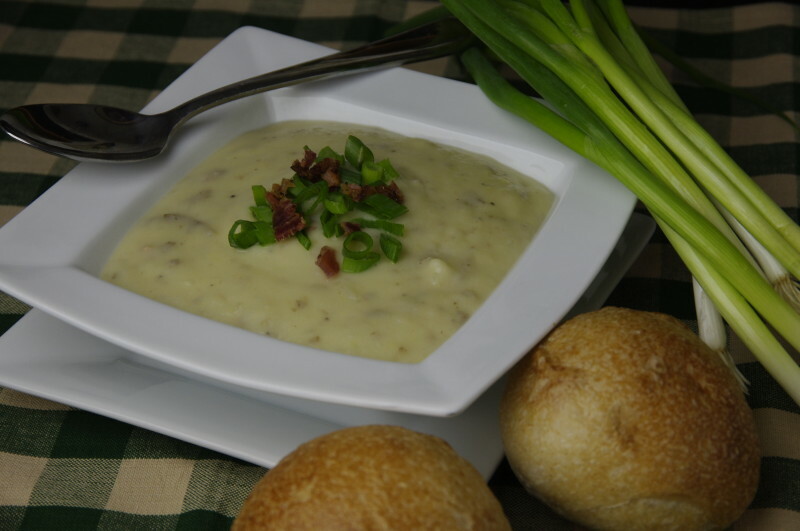 So any time you want to make muffins, pies, pumpkin rolls, soup or any other dish you can think of you can pull from the freezer, thaw and you have fresh puree. 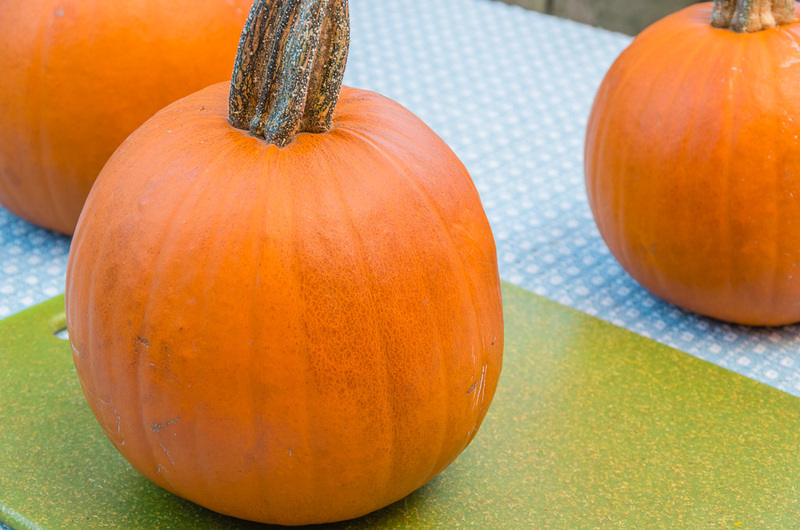 So what is the difference between using a Hubbard squash or a pie pumpkin? Both have a great fresh taste but I tend to use the blue Hubbard squash first over a pie pumpkin. 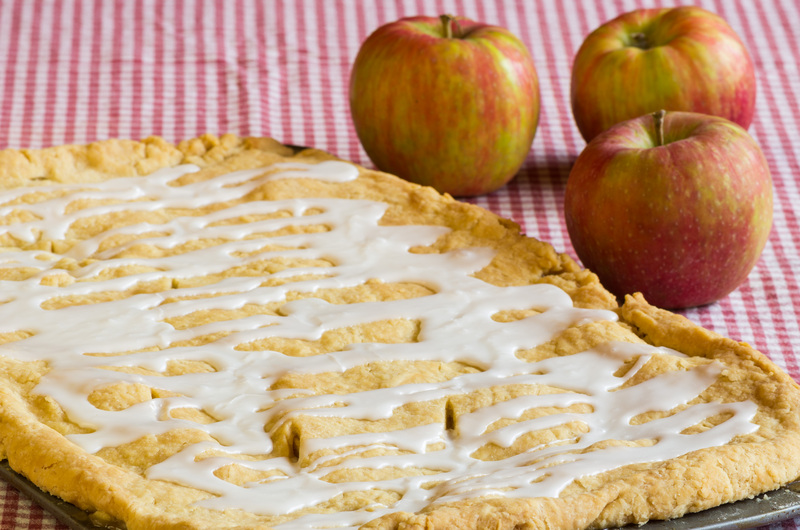 The taste of a blue Hubbard in a pie has a richer flavor and it is lighter in color. The hard shell of the blue Hubbard helps them keep for long periods in storage vs the pie pumpkin which has a thinner shell. 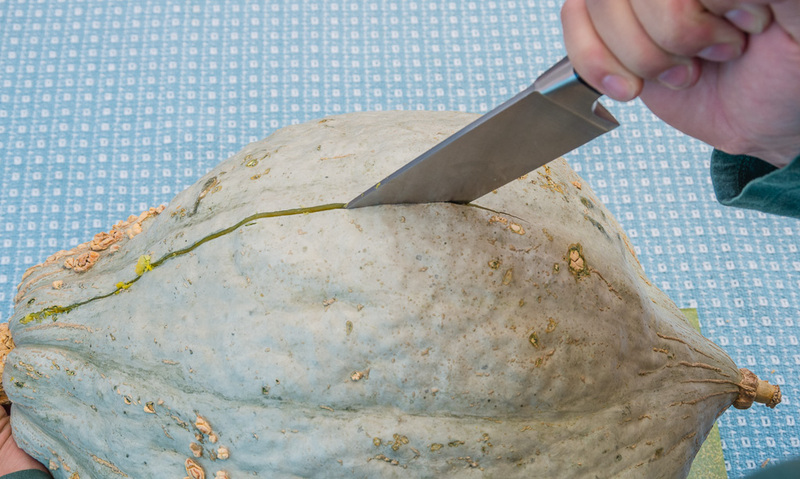 But the blue Hubbard squash is harder to find than the pie pumpkin and a lot harder to cut up. If using a pie pumpkin I always look for the ones with the most brown speckled spots. Check tomorrows post for recipe and how to make a homemade pumpkin pie and do not throw away your seeds I will have recipes for them too!